I am the Truax, I speak for the hardwood flooring industry…. It’s a sad fact of being a parent, but sometimes, for reasons I can’t explain, you will find inexplicably awful books appearing on your kid’s bookshelf. Usually, it’s just a crappy movie tie-in or a flea market oddity or a Burger King promotional item, but sometimes you find something really, truly odd. 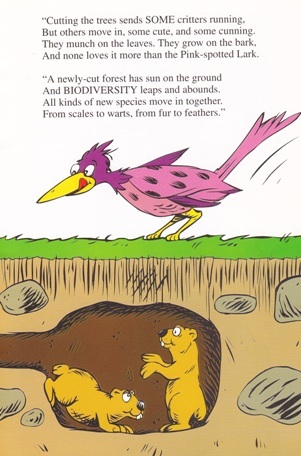 Case in point – one day, while on vacation, I found my 4-year-old daughter perusing a worn copy of Truax, a weird pamphlet of a picture book, published in 1995, that is supposed to be an eye-opening rebuttal of Dr. Seuss’ classic environmental fable, The Lorax. However, unlike Theodore Geisel, the creators of Truax didn’t rely on some stuffy, tree-hugging publishing company like Random House to release their iconic children’s tale. Instead, they wisely chose a more fair and impartial partnership to bring their story to the masses – The Truax was published “through a cooperative effort of the Hardwood Forest Association and the National Oak Flooring Manufacturers Association.” That’s right. Because if you want a balanced, agenda-free look at the logging industry, there’s, of course, no better source for information than the National Oak Flooring Manufacturers Association. My daughter found Truax – the title is just “Truax”, not “The Truax,” which sounds much better – at the bottom of a toy chest in an old family cottage in northern Michigan and, when asked what she was reading, she shook her head and said, “I don’t know. I’m very confused.” And I don’t blame her. 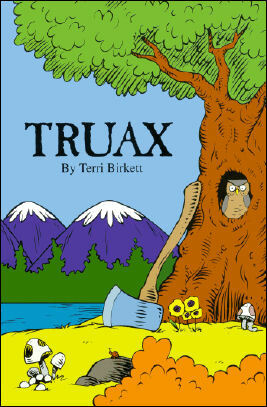 Truax is an odd little attempt at parody from people who obviously felt slighted by Dr. Seuss’ portrayal of the logging industry as a bunch of mean ol’ Once-lers in The Lorax. Is it amateurish? Heck yeah – it looks like it was written and drawn by the people who create kids menus for knock-off Big Boy hamburger chains – but the people creating it were, in fact, amateurs, so it’s a little hard to fault them for not having Seuss’ virtuoso skill with words and images. But, don’t worry, dear readers, there are a lot of other faults that you CAN hold against the Truax team. First and foremost, there’s no story. Say what you will about Dr. Seuss’ politics, but the man knew how to tell a story and he did actually work to create a nice little allegorical tale around the legend of the Lorax. Truax, on the other hand, is just 20 pages of an exasperated, conservative logger bemusedly shaking his head while he explains to a wacko-Lorax analog called Guardbark exactly how wrong he really is. The Guardbark raved on. He snarled as he shook. “I’m Guardbark, I tell you, keeper of trees. Our future, you know, is dependent on these. You must stop this hacking and whacking and stacking. The problem is – those lines only work out of context. When you read them within the context of the actual book, you realize that they’re meaningless. Truax NEVER listens to Guardbark, who’s portrayed as an ignorant lunatic, and all of Truax’s arguments are presented as God-certified truths with no room for debate. Truax likes talking more than “losing your head,” but that’s when he’s the only guy talking. Truax claims that, for every tree they cut down, they plant five more. (This “fact” shocked Guardbark.) He also claims that the planet relies more heavily on those young trees rather than fully-grown trees to create oxygen, so really, the hardwood flooring industry isn’t just giving us high-quality replacements for carpeting, they’re also giving us the air we breathe. And, again, Guardbark’s reaction is just a wide-eyed “REALLY?” Truax then gets further into the “truth of the matter” about how 95 million acres have been set aside in national preserves, “JUST to look nice,” so, really, what the heck is Guardbark complaining about anyway? And BIODIVERSITY leaps and abounds. All kinds of new species move in together. From scales to warts, from fur to feathers. Who knew that clear-cutting was so good for wildlife? So, forget the indigenous wildlife. Once we kick those shade-loving, wood addicts out of their leaf-covered welfare tenements, it’s going to open up a lot of opportunities for a more diverse, sun-loving animal population to drop in and thrive. I wouldn’t be nearly this incredulous about the Truax’s argument if the writer didn’t open the biodiversity section stating, “I like these discussions where views are debated. / So I dug up my facts and quickly I stated…” Right there, the author claims to welcome a healthy debate of opposing views, but then NEVER has any of Truax’s statements challenged or even backed up in any way and makes his sole opposition, Guardbark, a simpering, screaming mess. That carried a germ that made Cuddlebears sick? Like the Yellow-Striped Minnow that lives in Lake Zice? To keep a few minnows from dying away? And this is where Truax’s compassionate conservative act dies away and the cartoon logger starts wearing his bias on his sleeve. Fine, even earlier, Truax had been completely condescending and dismissive of the whole concept of nature preserves – jeez, we put away some trees JUST to look nice… isn’t that enough? – but the way he glosses over the extinction of entire species really is a thing to behold. Forget the debate. If an animal goes extinct due to logging, either a). it was probably secretly horrible or was just something cute to look at, or b). it was totally worth it for my high-quality, low-cost, beautifully-lacquered hardwood oak floors. There’s no reason to debate that any further. No need to bring up the impact on eco-systems, pollution, soil erosion… they’re non-issues. Truax explained all those cares away with his carefully composed “facts,” so why would Guardbark even need to question where those facts came from? 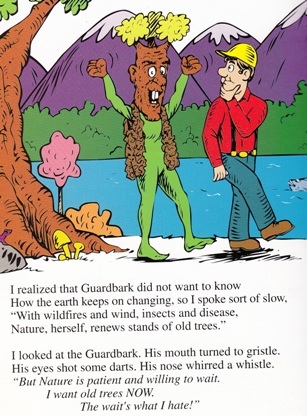 Since, like all people concerned about the environmental impact of rampant over-logging, Guardbark is obviously asking the world to never cut down a tree ever again – Truax imagines a future where all houses are built of “plastic and steel” – Truax just needed to explain to Guardbark that everything he believed in was wrong and Guardbark, for his part, walked away from the debate happier in the knowledge that he’d been worrying for nothing. The book actually ends with the line “I think things ARE NOT quite as bad as they seemed“… which, c’mon, does acknowledge that things still are kind of bad, right? That line alone, to me, seems way sadder and bleaker than anything Dr. Seuss put forth in The Lorax and The Butter Battle Book COMBINED. My daughter quickly discarded Truax – without any prompting from me – but I couldn’t leave it up at the cottage for another generation to stumble upon, so I tucked it in our suitcase and brought it home. It’s not that I’m trying to silence the viewpoint of The Truax (seriously, “THE Truax” sounds so much better). I just object to Truax pretending that it’s a kid’s book. Dr. Seuss and many other children’s writers have proven that powerful social allegories, often with the occasional political undertone, can work as children’s books – IF the author spends as much time crafting their story as they do crafting their message. The Lorax is a sophisticated, passionate fable that makes some very clever and interesting arguments about the impact of industrialization. Truax, on the other hand, is 20 pages of complaining about The Lorax. But, still, I’ll admit, there’s a tiny part of me that loves that the world is so big and varied and weird that I can go on vacation in the middle of the woods and my daughter can walk away with a bizarre little slice of propaganda that’s desperately trying to knock a classic kids’ book down a few pegs. I don’t want my daughter to ever make the same kinds of lazy, half-considered arguments that can be found in Truax, but I do love that, as she develops as a reader, she’ll constantly be exposed to the best and worst that children’s lit has to offer and she’ll have to make up her own mind about what’s quality and what’s garbage. If you’re interested in reading Truax, you can find a full PDF of the book here along with not-biased-at-all lesson plans and book reviews. You can also read a few decidedly funnier reviews of Truax on the book’s Amazon.com page. its always good to look at both sides of a issue but sometimes there isn’t a right and wrong or a good vs bad. simple put the lorax was a advocate for nature, he said it himself “i speak for the trees” the lorax story is a cautionary tale with a capital CAUTIONARY. It told a fictional account of what happened in a town where nature was less important than big business and the environment suffered. The logging industry felt bad but no one said the logging industry was bad, the tale just warns you to be careful. its a extreme case to make a point about pollution from factories or chemical waste or cutting down too many trees. the truax could have been better but honestly it cant change its view which is we use the trees to make money. its good that the logging industry plants new trees but we all know as humans we care less about animals than we do other humans or even money. Do you live in a house that is made of wood products? Yes…..
Why don’t you move out and live in a tent? There are two sides to every argument, both Lorax and Truax are biased in there own way. Neither is completely right or wrong. You are for making a mockery of the attempt to actually educate people about both sides and not just your favorite. Ended up on this website because my 7th grader at Lakeview Jr. High in Pickerington, OH is reading this in class. He is answering a list of questions about the book, which left him a little confused ‘who do you think wrote the book?’, ‘why do you think the book is named TruAx?’ So, I’m trying to figure out if this is a joke or what goes for national standards? I bought a copy of Truax, mainly because I love pollution and hate the environment (I put in an effort to litter or pour bleach on the ground or a number of other things every day). I’m not a conservative, I’m an eco-sinner. I can agree that Truax was slightly biased, but it has some valid points, and as for The Lorax, it portrays the Once-ler character as a personification of big business and industry, making it all appear incredibly corrupt although it really isn’t. What environmentalists are quick to forget is that these so-called “evil polluting factories” happen to be providing for employees and their families, and in turn giving the world useful products. When considering that, The Lorax has some biased ideas in it as well, and any book with the topic of environmentalism or pollution is going to, no matter what. That is why its best for a person to decide for themselves and make an informed decision based on a number of things. I’ve found books like ‘No Place for Eco-Sinners’ by Racheal Bates that are for pollution, whereas I’ve also found the incredibly biased film ‘An Inconvenient Truth’ and the fiction book ‘My Chemical Mountain’ which seems to have chose neither side of the argument, it really all depends. The important thing is not to take info out of context, and to always read or watch more than one thing to decide upon which side you’re for. I was looking for the Daily Show episode that featured this book and came across this website. I was quite suprised that this book is still around and I found out it had actually been banned by several schools. I always thought it was just a local pamphlet supporting the local Weyerhauser business. I had never even heard of it ’til the Daily Show came to interview (and, of course, ridicule) the author. I’m waiting for the sequel supporting the blowing up of mountain tops in defense of the coal industry. The Truax always gave me the feeling that those parodying The Lorax didn’t really understand the story that well. It wasn’t a blatant attack on the lumber industry but rather a warning about progress progressing too fast, greed, and what more for useless things that people think that they need. I remember watching the cartoon and wondering why the need to cut down the trees just to get to the truffs which seemed to be what was used, I didn’t get it then but I suppose I understand now that it’s taking more than what is needed. I did read the Truax and I gave it an unbiased try but all I could see was propaganda, their biased points with such little hard facts to drive their points, and their portrayal of the Guardbark felt rather insulting. They say that they plant new trees but what of the time that it takes to grow and what of the trees that they plant that doesn’t reach maturity? What of the issue of pollution that was addressed in the original? In comparison Truax lacks so much, it reads like a Mary-Sue fanfiction where the main character is always right, never at fault, and can sway anyone to their side with little to no effort. It feels like it was something quickly written out trying to focus more on defaming The Lorax and putting together a rhyming scheme more so than making their case plausible. I don’t wish to defend but from what I recall at least in The Lorax he admitted to old fashioned notions thus admitting his own bias. I clicked on the link to the PDF, but it just brought me to the Shaw Hardwood website. They must’ve changed the link since this post originally went live. Seriously? They had to use MY name as a title on a book? I claim infringement or somesuch! As a Truax I in no way condone this book. That made me laugh so hard I almost choked to death. Sorry for your troubles, Mr. Truax! I find this very similar to arguments made by large-scale animal producers: who knows better than us what is good for animals? I completey agree! I read this garbage and hated it–those greedy, floorwood-producing companies were just afraid that, God forbid, someone CARED about the environment more than industry. That book really irritated me. I just hope as many people as possible see this so they’ll know about how awful this book is. If kids can see through the politically incorrect Truax like your daughter, then why did you remove the copy so nobody else could read it? That makes you a hypocrite if you believe that only certain entitled people (you) can behave as censors. And I never said anything about me being part of an entitled few that should act as censors. That’s a line of rhetoric you invented all on your own. What I did is, in no way, censorship. In fact, my post actually directs people to where they can find The Truax online, so I’ve actually helped more people find the Truax online then would’ve ever found it at a family cabin in the woods. I just read the story and let me tell you that people have a point. What WOULD happen if no more trees got smack-wacked? You see we would have to live in houses of metal, witch is noisy and not special, and it DOES create lots of job opportunitys and not just for loggers, but for carvers and saw makers and witchit quackers alike so like they say in school, if you have something mean, not nice, or unclean,leave it at the door.